For something completely different I thought about posting here a few photos of a wonderful miniature racing car transport truck… And a matching miniature racing car. 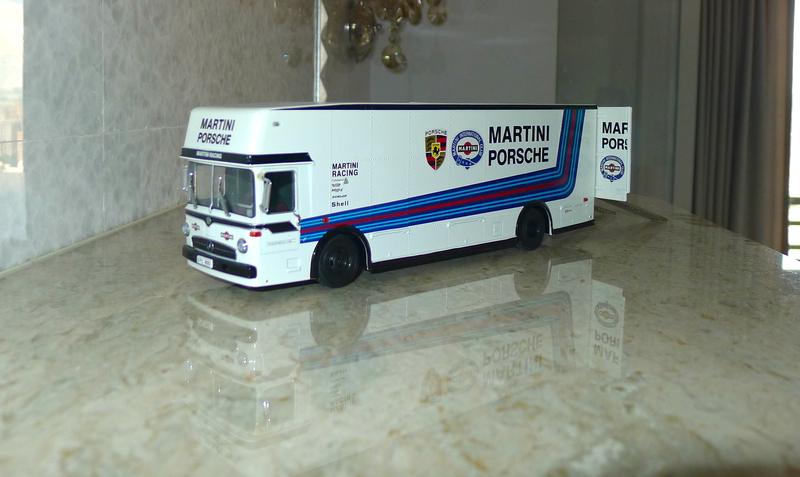 The truck is a Mercedes Benz, the miniature model in 1/43 scale of the one used by the Porsche Martini Racing Team in 1976. This one particularly was made as a limited edition by a german company – Premium ClassiXXs – and it is carefully put together and wonderfully detailed. 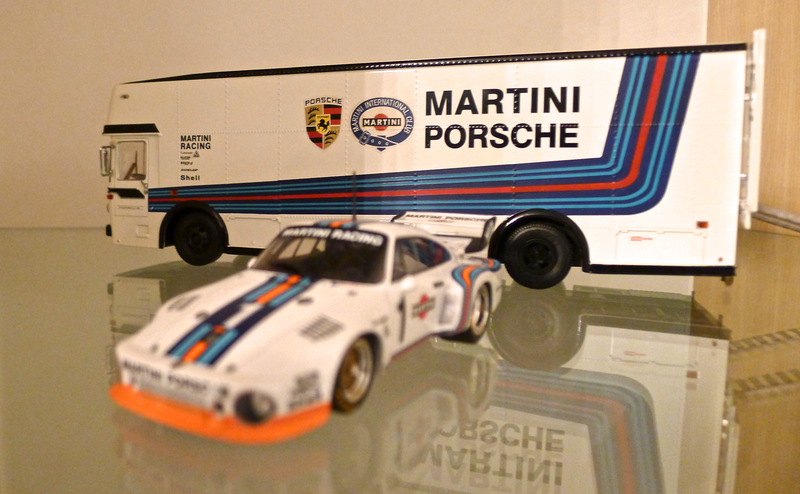 For good measure I’ve thrown in a Porsche 935 Martini Racing also from 1976, this one another limited edition, also in 1/43 scale, but produced by Minichamps, another german company. I feel that they really enhance one another… And just to add a bit more color to the story, let me tell you that they’ve been together for at least five years in a display at the Sogo Department Store in Taichung, Taiwan. Since 2007 I’ve been looking at both in this big glass cabinet in which some of their best miniatures are taken from their boxes and displayed. Several times I felt compelled to buy this truck, but somehow I felt the price to be slightly excessive and always ended up buying one or other Bentley from Minichamps. I’m very partial to them and Minichamps is Bentley’s official supplier for their miniatures. Then, a few months ago, in what was my third visit to Taiwan (this year), I went to Sogo and I just could’t take it anymore and took the pair home with me. Even the very nice person in charge of the scale model section was very happy (he actually gave me a discount and even offered me a present!!!). I reckon after five years of seeing me admiring the setup he also felt that there was, at last, a proper happy end. So, that’s it, when I arrived home I just couldn’t resist and I took a set of photos, part of which I’m now sharing with you… Both scale models are now in our house in Taiwan where they will be properly cherished. To view the complete gallery of photos just click on any of the miniatures below, I hope you’ll enjoy!